Lavender is one of the best-loved herbs in the garden, and for good reason. Not only is it attractive and scented, this versatile plant thrives in some of the toughest of garden conditions. Lavandula angustifolia, the English lavender, is very hardy – so much so that it thrives even in my exposed Scottish garden! In order for it to grow well, lavender has three basic growing requirements – very good drainage, relatively poor soil, and lots and lots of sun. In her Diary of a French Herb Garden, Geraldene Holt describes the preferred habitat of the wild lavender best: "Tracts of thin earth on the limestone terrain of the Midi support the scrubby flora known as the garrigue. Lavender and thyme grow wild on these steep, craggy slopes. They develop small, intensely scented leaves, as they struggle against the elements, pushing and threading their wiry roots into crevices between the rocks." These are the growing conditions that the domesticated lavender craves. My own lavenders are grown against a south-facing wall open to the prevailing wind, in a patch of light, stony, unimproved soil that many other plants would struggle to survive in. Lavender will tolerate quite a wide range of soil conditions as long as they're not waterlogged, but for best results well-drained, moderately fertile soil is ideal. It copes very well in containers. Due to its tolerance of windy positions, English lavender makes an excellent low informal boundary hedge or windbreak – the compact variety 'Hidcote' is a good choice. In cottage gardens a lavender hedge running down both sides of the path to the front door, where the scent and colour of the plants can be fully appreciated, is traditional. For the same reason, growing lavender next to seating areas is also a great idea. Lavender is a popular choice for growing alongside roses as it hides leggy rose stems during the winter months – famous cottage gardener Gertrude Jekyll, who developed the popular 'Munstead' lavender, loved this combination. In more modern gardens the subdued colour and informal habit of lavender is perfect for softening hard landscaping. If the classic bluish-purple varieties don't fit your colour scheme, you can also find white-flowered versions such as 'Alba' and its smaller sibling, 'Nana Alba' (great for border edging), and pinks such as 'Hidcote Pink' and 'Loddon Pink'. Lavender can be started from seed, but it does take some patience as germination can take many months. An easier way to propagate lavender is by cuttings, which provides a mature plant much earlier and ensures that it will be identical to the parent plant. Read our article on How to Successfully Take Cuttings of Herbs for more information. Pruning lavender in cool climates is a two-step process, whether for individual plants or for hedging. The flowering stems can be harvested while in bloom or snipped off after the flowers fade to keep the plant tidy. Leave the foliage over the winter to protect new growth from frosts, then in spring trim the plants fairly hard to prevent them from becoming leggy and bare at the base. It's important not to cut back into old wood however, as it won't regrow from this. In warm climates, all pruning can be carried out in the autumn. The downside to lavender is that it has a limited lifespan. Annual pruning as described above is a must to keep it bushy, but even with the most judicious care the plants will likely need to be replaced after 5-10 years. It's a good opportunity to try out a different variety however – I recently dug out an old tired lavender of uncertain parentage from my garden and replaced it with 'Munstead', which has slightly more greenish leaves. It's settling in nicely, despite a recent dry spell. Lavender, of course, is most famous for its perfume. 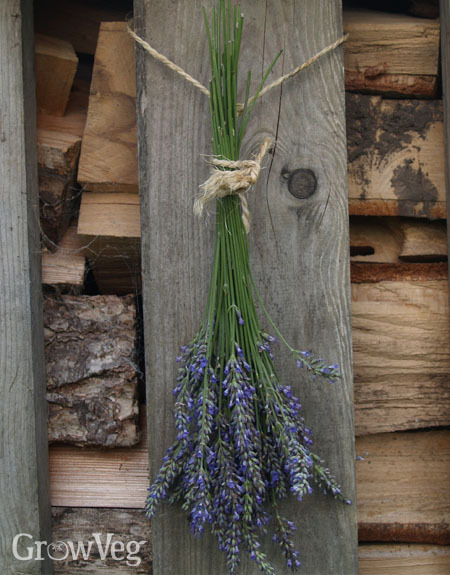 Harvesting and drying lavender is simple – simply snip off the stems just before the flowers open and when you've gathered enough for your needs, tie the stems together and hang them up to dry somewhere sheltered. After a few weeks the flowers will have dried fully, and can be shaken gently from the stems into a container. Store them in a lidded jar somewhere cool and dark, or pop them straight into a sachet to keep towels, sheets or clothes smelling sweet and to repel moths. If you suffer from insomnia, try inserting the sachets into a pillow so the calming scent can help you drift off to a restful slumber. Although edible, lavender is little used in recipes. It's occasionally included as a constituent of Herbes de Provence mixes, and leaves can be chopped and added sparingly to some sauces or used in shortbread biscuits – if you have any great lavender recipes, feel free to share them in the comments below. But, you don't have to harvest lavender. It's beautiful to look at, smells great when you sit next to it or pass by it, and the bees drawn irresistibly to it will do a great job of pollinating your garden! ""...threading their wiry roots into crevices between the rocks." - LOL! I've attempted to grow lavender from seed, three different times. Maybe it didn't like potting mix, and should give it the crappy stuff from around my barn instead!" "Hi Annie, sorry for the late reply! Growing lavender from seed can be tricky. If you're having trouble but still want lavender in your garden, young plants are commonly available in a wide selection of varieties." "I have lavender growing successfully and the bees love it! Unfortunately, last year I cut back Iris that was overwhelming the lavender and exposed stems to air, sun etc. However, I love the site of the lavender with old as well as new growths apparent now that spring is present in New Jersey. I did nothing to the stems and wonder what is the proper treatment now?? " "Hi Sandy, if you don't mind seeing the old woody growth, just give your lavender a light trim over to help keep it bushy. The woody growth is unlikely to sprout new leaves, but you can always plant a lower-growing perennial in front to hide the woody parts if you like!" "I've seen new growth from old wood on lavender bushes. Maybe it helps that I didn't cut off all the green stuff? I just shortened some of the more straggly branches to tidy the plant, and it seems reinvigorated." "I was just wondering what type of lavender is used in bouquets It is a long stem. Or a hardy harder stem. Do you have a name for this kind "
"Last Fall I snipped two-inch pieces from the tips of my lavender, stripped the bottom half, and stuck them in the ground. Voila! About half of them rooted by February! Now, the four-inch potted plants even have sprigs of flowers on them!" "Hi Elspeth, as long as you don't cut back into the old wood beyond the last green leaves on a branch, it will regrow. " "When byou say 'exposed Scottish garden' which region would that be? I'm on the Moray coast and would love to grow lavender and sunflowers. " "Hi Jay, I'm in the Borders so quite a bit further south than you. I'm also inland, so your coastal garden will pose different challenges - some plants don't cope too well with salt spray, though lavender is fine. I find tall-growing plants such as sunflowers impossible to grow as the wind rips them to shreds, but dwarf varieties fare much better. If you can provide a windbreak of some kind, for instance shade netting, or salt-tolerant shrubs or hedging such as sea buckthorn - which incidentally also has edible berries - you should find that you can alter your garden's microclimate enough to grow a much wider range of plants. There's a book called Fruit and Vegetables for Scotland, by Kenneth Cox and Caroline Beaton, which is well worth looking out for. I hope that helps!" "Hi! My dad and I are starting a farm in Oklahoma and we are thinking about using lavender as a windbreak and also utilizing it for the flowers, oil, etc. and as a possible deer deterrent. The roadblock we are running into is selecting the best kind of lavender to grow and the best way to grow it. We have read that starting from seed can be tricky, but is it more cost effective to try seeding for a large scale rather than buying plugs or plants? Any help/advice you can offer would be very much appreciated. Thank you!" "Hi Natalia. Starting lavender from seed is tricky and can take a long time from sowing to mature plant. One option that could speed things up at bit would be to buy a few plants and then take cuttings from them - that way you'd ensure you got exactly the same variety each time and it would be very cost-effective. Click on the link to our article How to Successfully Take Cuttings of Herbs in the article above for more information. Be aware that most common varieties of lavender are about 60cm (2ft) high or less, so may not the best choice for an effective windbreak, depending on your situation." "Someone told me they had lavender tea. How do you make lavender tea?" "Nice article, very informative. I once visited a lavender farm in Missoula Montana where we were served lavender lemonaide. It was lovely!"